If you want a high-end MacBook Pro, this is the best Black Friday deal we've seen so far; get on it! Every designer wants a MacBook Pro in their life, right? 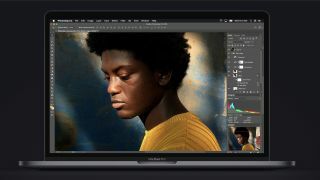 But we all know that they tend to be priced outside of the average designer's budget, so if you have your heart set on one then you're probably keeping a watchful eye on the latest Black Friday MacBook deals. Well here's the good news: we may well have found exactly what you're looking for. This hot deal from Laptops Direct presses all our buttons: it's a 15-inch MacBook Pro that's dripping with all the high-end specs you're after. That means an Intel Core i7 processor, 16GB RAM, a 256GB SSD and, best of all, a Touch Bar that'll put all the context-sensitive commands you need right at your fingertips. Normally you'd expect to pay well over two grand for one of these punchy little beauties, but Laptops Direct is selling this one for just £1599.97 – that's £590 off the usual price, and well worth jumping on right now as we doubt you're going to see a much sweeter offer among all the Black Friday and Cyber Monday deals. There's one tiny downside: you'll have to wait until 7 December for delivery, but we reckon that's an inconvenience that's well worth putting up with. And if this deal's still a bit rich for your budget, it's worth taking a look around the Laptops Direct site for some top deals on older refurb models that you can snap up for under a grand. Save £590: You'll be hard pushed to find a better MacBook Pro deal than this; Core i7, 16GB RAM, 256GB SSD and a Touch Bar all add up to a delectable piece of kit, and it comes in Space Grey.